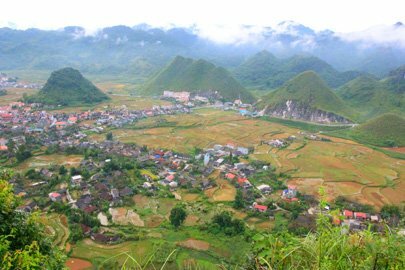 Ha Giang Province is famous for Dong Van Geopark which is recognized as a Karst Plateau Global Geopark by UNESCO. 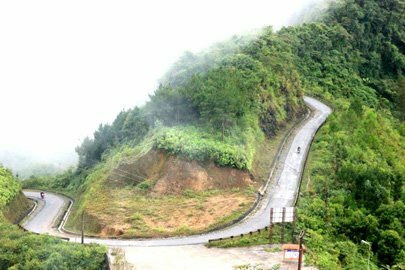 The gateway to the geopark is called Quan Ba by local people meaning skydoor due to its height and the fact that fog always covers the top, which makes people think it is the door to the sky. Not only that but it has a magnificent panoramic view of Tam Son City appearing in the green valley below. It is also the perfect spot to appreciate the beautiful Fairy Twin Mountains which lie in among the rice fields. Its reverse bowl shape has made the Twin Mountains special from other mountains. The mountains resemble a woman’s breasts - that’s why in local language they call them fairy twins. It takes around half an hour from Tam Son City to Quan Ba skydoor. The road is poor and is full of large trucks which slow your speed considerably as you have to be very careful to avoid accidents. Tourists can stay at Tam Son City which has nice hotels and restaurants. In addition to Quan Ba skydoor and Fairy Twin Mountains, tourists may find it interesting to go to Quan Ba market day or the Hop Tien Weaving village of H’Mong minority people.